New Delhi, 27 June 2017: The Minister of Shipping and Road Transport and Highways Shri Nitin Gadkari has said that Cruise Tourism is one of the fastest growing components of the leisure industry worldwide, and can be a major growth driver for the Indian economy by generating huge employment opportunities. Shri Gadkari was speaking at the National Workshop on “Action Plan for Development of Cruise Tourism in India”, in New Delhi today. The workshop was also attended by Minister of State for Culture and Tourism (I/C) Dr Mahesh Sharma, and representatives of all stakeholder organizations – both from the government and the private sector – including regulatory agencies which deal with issues impacting cruise tourism. 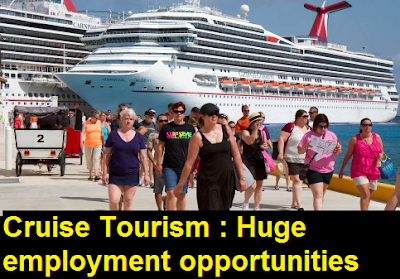 Pointing out that tourism has the highest investment to employment multiplier Shri Gadkari said that on an average, employment generation on a cruise ship is 1 job for 3-4 passengers. With India having the potential to cater to 700 cruise ships per year as against 158 handled this year, the cruise industry can generate more than 2.5 lakh jobs for ten lakh cruise passengers, giving a big boost to the country’s economy. He further informed that cruise terminals are being developed at five major ports – Mumbai, Goa, Cochin, Mangalore and Chennai. In addition, the transport potential of 111 inland waterways will also be tapped. Work will start for developing ten inland waterways by the end of this year. This includes the rivers Ganga and Brahmaputra on which work is already in progress, he informed. Shri Gadkari called upon state governments also to play an active role in promoting cruise tourism by developing, packaging and marketing their tourists attractions to draw more and more tourists. The Ministry of Shipping has been working actively with all relevant ministries and organizations of the government to promote cruise tourism in the country. A joint task force headed by Secretary Shipping and Secretary Tourism was constituted for the purpose, and a global consultant was engaged for drawing up an Action Plan. The objective of today’s workshop was to discuss this Action Plan which requires various arms of the Government to take action for creating an enabling business eco-system for growth of cruise tourism in the country. Speaking on the occasion Dr Mahesh Sharma said that India is fast growing as an attractive tourist destination. To realize the full potential for cruise tourism in the country there was a need for all stakeholders to work together, in cooperation with each other, and create a favourable ecosystem for growth. Highlighting the efforts of the Shipping Ministry for promoting cruise tourism, Dr Alok Srivastava, Special Secretary (Shipping), informed that e visa, e-landing and incentives like minimum rebate of 30% on all cruise vessel related charges and additional rebate of 25% for coastal cruise movement have already been implemented. Further to this, a joint task force has been set up by the Ministry of Shipping & the Ministry of Tourism and an action plan for deriving standard operating procedure has been drawn, which would be implemented in a time bound manner after discussion with various stakeholders. Secretary Tourism Smt Rashmi Verma said that the coming together of the Shipping and Tourism ministries to promote cruise tourism in the country would help maximize the benefits that the sector has to offer. Stakeholders discussed several regulatory issues pertaining to various aspects of cruise port operations namely security, immigration, customs, ports in the workshop. They worked towards drawing up Standard Operating Procedures for all govt. organizations for cruise vessel handling.